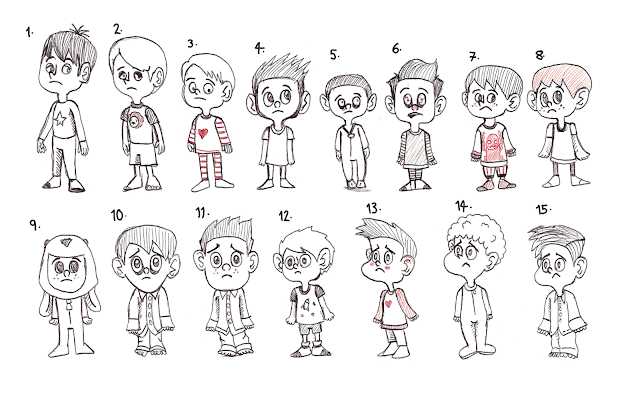 I decided to sketch up some ideas for the boy character, I don't think any of these are my boy yet but I will keep jotting down ideas. 6 and 9 look cool to me, 6 has a very Tim Burton look to it. I like 7 it is cool that he has like monster pyjamas!! for me it's 3 - just an ordinary little boy - he could be anyone of us. Okay - 3 polished and tweaked here and there. You can probably start thinking in pictures for these. More to follow as and when. For sleep, he believed, would wind up with him dead. that his bed was a monster and his room was its lair. The boy and his bed waged their ongoing battle. His bed circles slowly like a ravenous shark. So still must the boy be - he can't lose his head. It’s down there, he knows it and it’s coming up fast! So high up on the wardrobe he climbs like a mast. For his bed never rests in its dreadful endeavour. So as to wrap the boy up and wrap him tight as a mummy. He sees the bed creep toward him, not a shark now, a spider! But the boy can’t escape! He gives a blood-curdling scream! Thinking ‘poor little chap,’ and stroking his hair. But come the next morning they found their boy gone. That’s the thing about grown-ups. They get these things wrong. *the* boy tells them 'No!' - typo, sorry! Thank you for all the help Phil! I like it, it does sound much better. We can make the parent issue work as well.